Wynn's Chart: More Steve Wynn or Steve Winwood? After an embarrassing string of events leading up to Steve Wynn leaving his fancy, eponymous hotel/resort empire, combined with a recent earnings miss, WYNN's stock price has not itself (nor its investors) any favors since Memorial Day. With shares sliding from just over $200 to a recent low of $146.26, investors are understandably anxious as to the true direction of the firm--After all, WYNN's customer base is composed of high net worth and aspiration high end consumers who are unlikely to show much brand loyalty if, say, LVS or MGM properties make bold moves to win over their business to their own higher end properties. Thus, the question is whether the stock will continue down the road of the crestfallen way it seems to be on now or, instead, pivot to a more upbeat Steve Winwood version where it will be back in the high life again, because we know they continue to charge resort prices and fees on par with "the high life," indeed. Inside the VIP arm of Market Chess Subscription Services, we sold out of a long-term WYNN long earlier this year in light of the Wynn scandal and subsequent fallout in shares. We wanted to lock in the win, selling first and asking questions later. 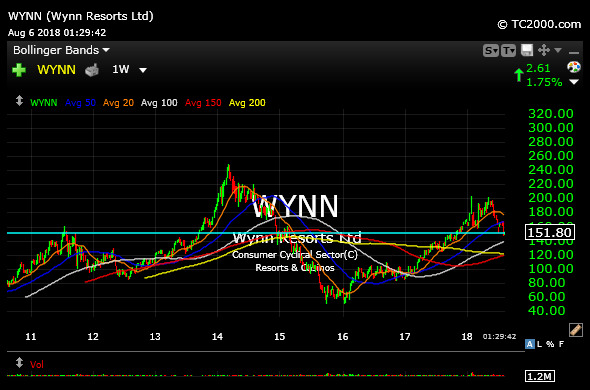 However, looking at the weekly chart for WYNN, below, price is back down to the prior 2011 highs (light blue line). I expect this to be a fairly significant battleground around the $150's, and am looking for signs of stabilization to probe a swing trading long, even if the long-term bull case is now under much more scrutiny in light of the events the firm has faced this year. Still, in order to have any chance of being back in the high life again, WYNN must continue to at least hold the 150's going forward.